Originating in South America, petunias come in an almost unlimited assortment of colors, shapes, and sizes. From compact types with dime-sized blooms to trailing types that form massive, large mounds, there's a petunia to fit any garden situation. Petunias can be used on their own in beds and borders or add them to containers and baskets with other sun-loving bloomers. Trailing types can also be used as a colorful annual groundcover. In addition, many petunia varieties are delightfully fragrant. Hummingbirds and a plethora of pollinating insects will also flock to your garden to feast on the nectar-rich petunia blooms. Petunias thrive in an open spot that receives at least 6 to 8 hours of direct sun a day. The plants like a loose, rich, slightly moist soil. 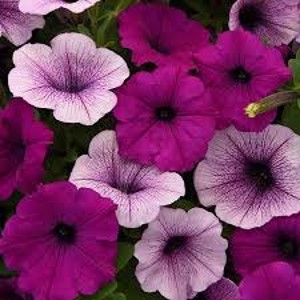 If you are growing petunias in containers, plant them in a commercial potting soil mix. To grow petunias directly in a bed or border, be sure to add plenty of organic matter at planting time. Petunias have a tendency to get leggy and bloom less heavily in late summer. To make them last into the fall, cut the plants back by 1/3 and then fertilize them to encourage new growth.